The visit underscored Bolsonaro’s embrace of U.S. influence in Latin America to confront what he calls a communist threat against democracy—a theme he remarked on during a dinner on Sunday evening with his ministers and right-wing thinkers. Presidential advisers, including his official spokesman, had said during the dinner that his agenda on Monday morning would be kept private. Bolosnaro’s justice minister, Sérgio Moro, came along for the trip to the agency, but members of the media were not allowed inside, according to The Associated Press. 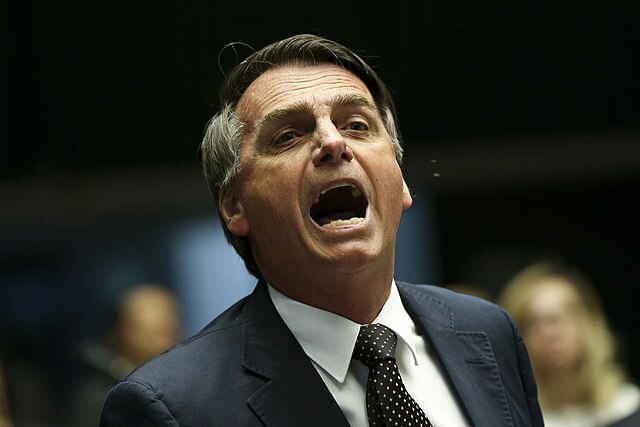 Bolsonaro has been widely criticized for targeting the human rights of vulnerable populations, pushing to privatize public services, and turning over the Amazon to powerful agribusinesses. At their Tuesday meeting, Trump and Bolsonaro—who have maintained a publicly cozy relationship—are expected to discuss military and economic ties between their countries, and the political crisis in Venezuela. Both leaders have recognized Venezuela’s self-declared “Interim President” Juan Guaidó, who has spent weeks trying to oust President Nicolás Maduro based on claims that his latest election was illegitimate. Bolsonaro’s visit to the CIA—which has a long history of meddling in Latin American politics and overthrowing democratically-elected governments—comes amid mounting concerns of foreign military intervention in Venezuela, as Maduro has hung on to power in spite of “strangling” economic sanctions imposed by the Trump administration. Tweeting about CIA visit in Portuguese, Brazilian lawmaker David Miranda drew attention to the U.S.’s record of spying on Brazilian leaders—which was exposed by Glenn Greenwald, Miranda’s husband and one of the first journalists to report on the trove of secrets leaked by whistleblower Edward Snowden. Em 2013 eu eu meu marido @ggreenwald mostramos o sistema de vigilância do EUA e seus aliados, que inclusive espionava os líderes de estado brasileiro e nossas estatais. Bolsonaro agora vai na CIA. Síndrome de vira-lata escancarada. Vá ter luta pela soberania Nacional!